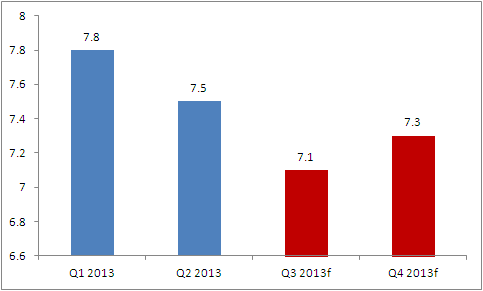 The Philippines economy grew by 7.8% and 7.5% in Q1 and Q2 2013 respectively. These growth rates were among the highest in Asian region. The growth of the country is continuously pushed by increasing social spending fueled by Overseas Filipino Remittance (OFW) and domestic productivity. Government projects and private construction are major contributors to the growth trajectory; however, political scandals are seen to slowdown government expenditure which is seen to affect the overall economy as well. Data have shown that number of approved building permit in first half of 2013 is less than the forecast of Philippine Economist; yet, second half projection is seen to have higher numbers. In Q3 and Q4 2013, Philippine Economist expects the (real) GDP growth to be at 7.1% and 7.3% respectively. The overall projection of 2013 GDP growth is approximately 7.4%. Despite the bright growth projection of the economy, service sector remains the bread winner of the family while manufacturing sector is seen to stagnate. The scenario is seen as the cause of income disparity; service sector employs majority of the college graduates while manufacturing sector employs majority of less skilled workers. On one hand, people finding it hard to land a good job in the domestic market sees working abroad as an opportunity. Yet, while current demand for OFWs is positive, in the future, jobs abroad are seen to be scarce as a result of global economic slowdown. On the positive side, Moody's joined the club of credible rating agencies that gave Philippines an investment grade; the first to upgrade was Fitch Rating followed by Standard and Poor. The rating upgrade will boost foreign investment and lower interest rate in foreign borrowings.